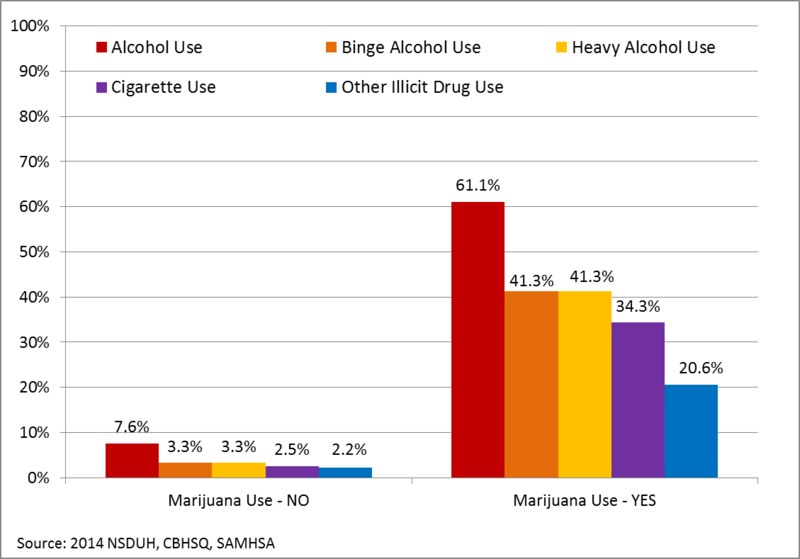 Nationally representative data from the National Survey on Drug Use and Health shows that alcohol, tobacco and marijuana are by far the most widely used drugs among teens. This is no surprise because of the legal status of these entry level, or gateway, drugs for adults5 and because of their wide availability. Importantly, among American teens age 12 to 17, the use of any one of these three substances is highly correlated with the use of the other two and with the use of other illegal drugs.6 Similarly for youth, not using any one substance is highly correlated with not using the other two or other illegal drugs. For example, as shown in Figure 1, teen marijuana users compared to their non-marijuana using peers, are approximately 8 times more likely to use alcohol, 12 times more likely to binge drink or drink heavily, 13 times more likely to smoke cigarettes and 9 times more likely to use other illicit drugs, including opioids. There are similar data for youth who use any alcohol or any cigarettes showing that youth who do not use those drugs are unlikely to use the other two drugs. Together, these data show how closely linked is the use by youth of all three of these commonly used drugs. These findings show that prevention messaging targeting youth must address all of these three substances specifically. Most current prevention efforts are specific to individual substances or kinds and amounts of use of individual drugs (e.g., cigarette smoking, binge drinking, drunk driving, etc. ), all of which have value, but miss a vital broader prevention message. What is needed, based on these new data showing the linkage of all drug use by youth, is a comprehensive drug prevention message: no use of any alcohol, tobacco, marijuana or other drugs for youth under age 21 for reasons of health.7 8 This no use prevention message provides clarity for young people, parents, physicians, educators, communities and for policymakers. It is not intended to replace public health prevention messages on specific substances, but enhances them with a clear focus on youth. Some claim adolescent use of alcohol, cigarettes and marijuana is inevitable, a goal of no use of any drug as unrealistic and that the appropriate goal of youth prevention is to prevent the progression of experimentation to later heavy use or problem-generating use. These opinions are misleading and reflect a poor understanding of neurodevelopment that underpins drug use. Teens are driven to seek new and exciting behaviors which can include substance use if the culture makes them available and promotes them. This need not be the case. New data in Figure 2 show over the last four decades, the percentage of American high school seniors who do not use any alcohol, cigarettes, marijuana or other drugs has increased steadily. Fifty-one percent of high school seniors have not used any alcohol, cigarettes, marijuana or other drugs in the past month and 26% have not used any alcohol, cigarettes, marijuana or other drugs in their lifetimes. Clearly making the choice of no use of any substances is indeed possible – and growing. Although the use of all substances has declined over the last four decades, their use has not fallen uniformly. 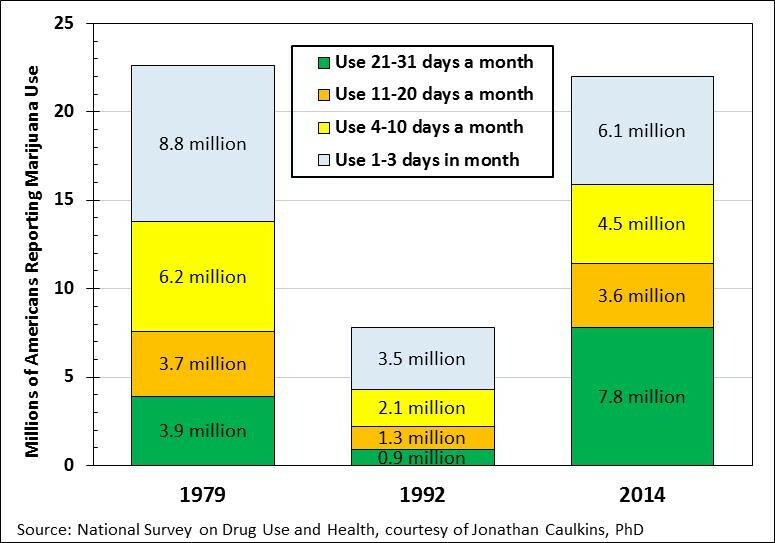 The prevalence of alcohol use, illicit drug use and marijuana use took similar trajectories, declining from 1978 to 1992. During this time a grassroots effort known as the Parents’ Movement changed the nation’s thinking about youth marijuana use10 with the result that youth drug use declined a remarkable 63%. Rates of adolescent alcohol use have continued to decline dramatically as have rates of adolescent cigarette use. Campaigns and corresponding policies focused on reducing alcohol use by teens seem to have made an impact on adolescent drinking behavior. The impressive decline in youth tobacco use has largely been influenced by the Tobacco Master Settlement Agreement which provided funding to anti-smoking advocacy groups and the highly-respected Truth media campaign. 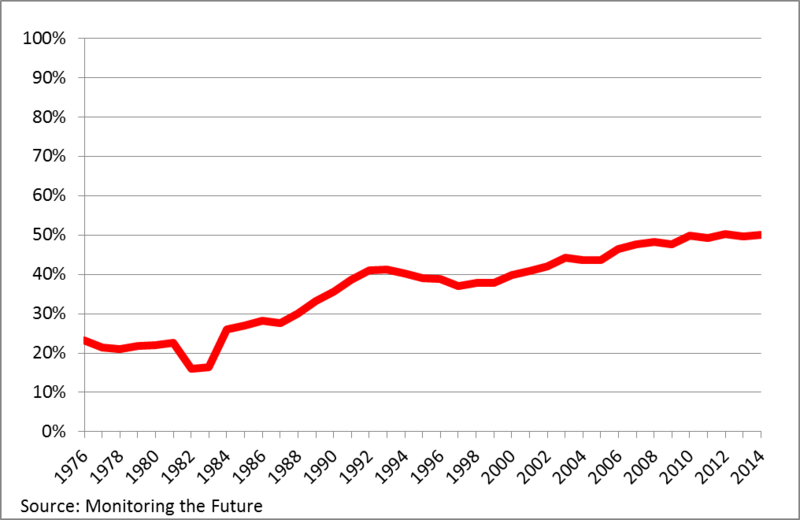 The good news from these long-term trends is that alcohol and tobacco use by adolescents now are at historic lows. It is regrettable but understandable that youth marijuana use, as well as use of the other drugs, has risen since 1991 and now has plateaued. The divergence of marijuana trends from those for alcohol and cigarettes began around the time of the collapse of the Parents’ Movement and the birth of a massive, increasingly well-funded marijuana industry promoting marijuana use. Shifting national attitudes to favor legalizing marijuana sale and use for adults both for medical and for recreational use now are at their highest level11 and contribute to the use by adolescents. Although overall the national rate of marijuana use for Americans age 12 and older has declined since the late seventies, a greater segment of marijuana users are heavy users (see Figure 4). Notably, from 1992 to 2014, the number of daily or near-daily marijuana uses increased 772%.12 This trend is particularly ominous considering the breathtaking increase in the potency of today’s marijuana compared to the product consumed in earlier decades.13 14 15 These two factors – higher potency products and more daily use – plus the greater social tolerance of marijuana use make the current marijuana scene far more threatening than was the case four decades ago. 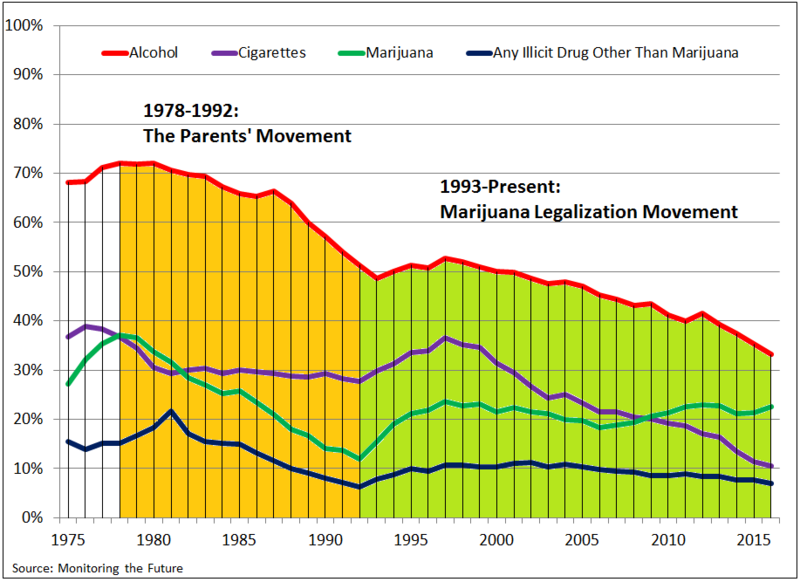 Through the Parents’ Movement, the nation united in its opposition to adolescent marijuana use, driving down the use of all youth drug use. Now is the time for a new movement backed by all concerned citizens to call for no use of any alcohol, tobacco, marijuana or other drugs for youth under age 21 for reasons of health. This campaign would not be a second iteration of the earlier “Just Say No” campaign. This new no-use message focuses on all of the big three drugs together, not singly and only in certain circumstances such as driving. This rare commonality of opinion in an otherwise perfect storm of disagreement provides an opportunity to protect adolescent health and thereby reduce future adult addiction. Young people who do not use substances in their teens are much less likely to use them or other drugs in later decades. The nation is searching for policies to reduce the burden of addiction on our nation’s families, communities and health systems, as well as how to save lives from opioid and other drug overdoses.18 Now is precisely the time to unite in developing strong, clear public health prevention efforts based on the steady, sound message of no use of any alcohol, tobacco, marijuana or other drugs for youth under age 21 for reasons of health. 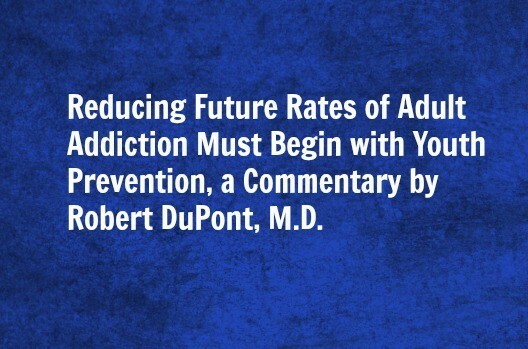 We published another article by Dr. DuPont on addiction and Drug Policy Reform. For more than 40 years, Robert L. DuPont, MD has been a leader in drug abuse prevention and treatment. Among his many contributions to the field is his leadership as the first Director of the NIH National Institute on Drug Abuse (1973-1978) and as the second White House Drug Chief (1973-1977). Dr. DuPont has written for publication over 400 professional articles and 15 books and monographs on a variety of health-related subjects. His books include Getting Tough on Gateway Drugs: A Guide for the Family, A Bridge to Recovery: An Introduction to Twelve-Step Programs and The Selfish Brain: Learning from Addiction. 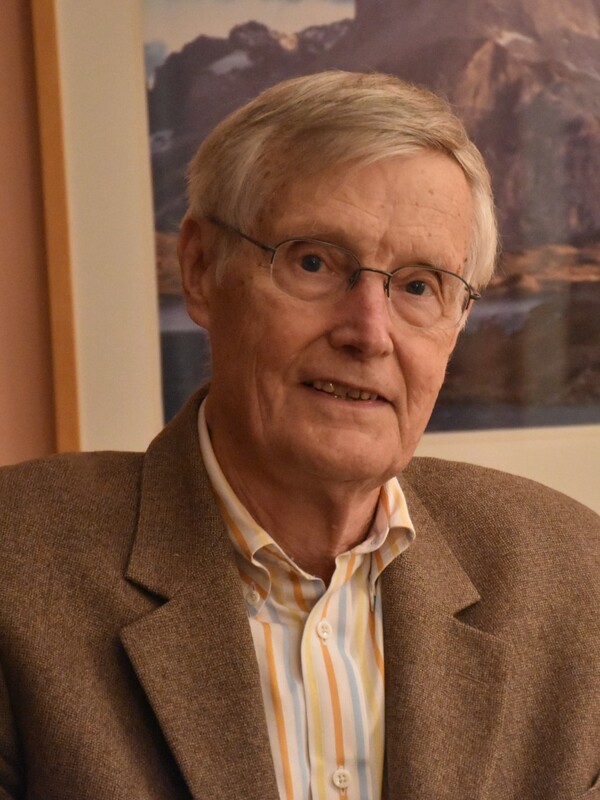 A graduate of Emory University, Dr. DuPont received an MD degree in 1963 from the Harvard Medical School. 4Among Americans age 12 and older who meet criteria for substance use disorders specified in the Diagnostic and Statistical Manual of Mental Disorders, 4th edition (DSM-IV). 5Marijuana remains illegal under federal law but is legal in some states for recreational use the legal age is 21, and in some states for medical use, the legal age is 18. Nationally the legal age for tobacco products is 18 and for alcohol it is 21. 7DuPont, R. L. (2015). It’s time to re-think prevention: increasing percentages of adolescents understand they should not use any addicting substances. Rockville, MD: Institute for Behavior and Health, Inc.
10Dufton, E. (2017). Grass Roots: The Rise and Fall of Marijuana. New York, NY: Basic Books. 13ElSohly, M. A., Mehmedic, Z., Foster, S., Gon, C., Chandra, S., & Church, J. C. (2016). Changes in cannabis potency over the last 2 decades (1995-2014): Analysis of current data in the United States. Biological Psychiatry, 79(7), 613-619.